SEOUL, Oct. 12 (Yonhap) — The two Koreas will hold high-level talks next week on ways to implement their latest summit deal, Seoul’s unification ministry announced Friday. The two sides agreed to have the meeting Monday at the Peace House, a South Korea-controlled building in the truce village of Panmunjom, according to the ministry. “This afternoon, the government sent a message to accept it,” it added. 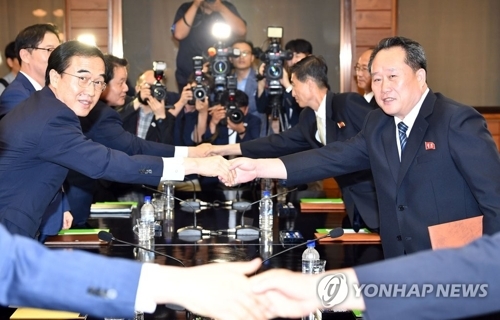 The two sides will have “consultations in general on how to implement the Pyongyang Declaration in September and decide schedules for follow-up negotiations by field,” the ministry said. The ministry was referring to an accord between President Moon Jae-in and the North’s leader Kim Jong-un agreed to on Sept. 19. It calls for a set of measures on easing tensions and fostering inter-Korean exchanges in addition to the North’s commitment to denuclearization. In the high-level talks, the two Koreas are expected to discuss a plan to establish a joint military committee and launch a joint on-site survey of the North’s roads and railways for a modernization project. Also among the agenda items are the Pyongyang Art Troupe’s plan to perform in Seoul in October, South Korea’s push for a united team at the 2020 Olympics and a bid to host the 2032 Olympics together.